Some of you may be waiting on an Autumn Rose FO post…and one will come, just as soon as I weave in those last couple ends I should have already done by now find a photographer. But in the mean time, I have a book review that’s been waiting in the wings – and it ain’t even a knitting book! I think most of you know where I stand on cupcakes. (I am on the side of cupcakes). During the last year of finishing my PhD dissertation, I baked them a lot. Baking things gives me the same great sense of satisfaction and accomplishment that I get from knitting, only a lot faster and with frosting on top. Delicious, delicious, procrastination. This, I feel, is a good thing. 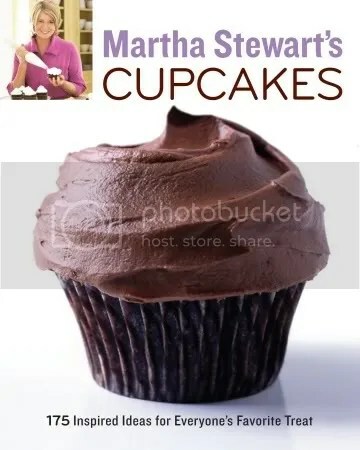 And because I know my way around a cupcake pan, I was very curious to have a look at this new offering in the baking world: Martha Stewart’s Cupcakes. When it comes to Martha Stewart, I am admittedly ambiguous. On the one hand, I often find that her cooking recipes ask a few ingredients too many and are a little bit fussy, and I steer clear of the home decor stuff entirely. (Why would I give up the precious knitting time?) On the other hand, a lot of her recipes are quite simple and her techniques often make a lot of sense, and I think the complicated, overly precise and finicky projects of Martha’s often overshadow the ones that are in fact very do-able, very practical, and – in this case – very tasty. Not everything needs five million steps, and I’m glad that Martha (or possibly her staff) realize this. And lo, this cupcakes book does not disappoint. If you are a fan of baking, if you could potentially become a fan of baking, or you know someone who can tell their all-purpose and cake & pastry flours apart, then you just might need this book. It is worth it. It has a good supply of standard recipes – vanilla buttermilk, devil’s fudge, blueberry, carrot, one-bowl chocolate, marbled swirl – on up to filled, glazed, and carefully decorated ones. If you want to get out the pastry bag and decorating tips, well, Martha is here for you. If you want to just bake some plain old cupcakes and slap some plain old icing on them, this book will do that too. Overall, I’m glad to have tried out this book and I think it is a great collection of recipes. A must-have for the cupcake baker. Don’t worry about complicated. Your cupcakes do not need ganache filling or candied walnut sprinkles or complexly piped icing. If you want to put all of these things on, people will gobble them up happily, but I have never seen anybody refuse a well-made plain vanilla cupcake with vanilla frosting. They are just as delicious. I have made three recipes from this book: Vanilla Buttermilk cupcakes with Swiss Buttercream Frosting, Devil’s Food Cake (chocolate cake) with Chocolate Ganache Frosting (these may be the ones on the cover of the book), and Mini Raspberry Cheesecakes. They were all fantastic, and I regret very much that I do not have pictures of these endeavours. Although I think this book is a great resource overall, I do have a couple of gripes with Martha. For one, despite incredibly clear written and photographic instructions on all the recipes, this book assumes that you are baking with the aid of a stand mixer (a la the ubiquitous Kitchen Aid one, or similar). While I have recently been able to have the use of my mother’s stand mixer (and it is, in the immortal words of Ferris Bueller, “so choice”), I am here to tell you that you do not need to own a stand mixer in order to bake cupcakes. The vast majority of baking that I have done in my lifetime thus far, has been with regular mixing bowls and hand mixers. It can be done, and I do wish Martha would acknowledge this more often. Second, I think anyone using this book would do well to skip past Martha’s written introduction and just use the recipes. She paints a picture of cupcakes as incredibly indulgent, cosmopolitan affairs that belong in trendy upscale bakeries and complex adult dinner parties. This is surely the image that cupcakes have taken on recently, thanks to trendy NYC cupcakeries and similar spots, but let’s not forget what cupcakes are: they are small cakes, they are yummy, and they are meant to be eaten. They are for people of all ages, and they belong in your cluttered kitchen, eaten with your fingers while leaning over the sink, just as much as at a fancy party. Third, the quantities in this book are large. Many of the recipes make three dozen cupcakes, which means some recipe adjustment is probably in order much of the time. 1. Do allow your cupcakes to cool completely before frosting them. There is nothing worse than successfully applying a beautiful swirled mountain of frosting with a piping bag before watching it all melt out into a splat. 3. One of the best gadgets you can get if you are going to bake on a regular basis is an ice-cream scoop with a release mechanism. It is about the perfect amount of batter that needs to go into a waiting cupcake liner. 4. Do the little things that seem finicky and stupid. DO pre-heat the oven. DO make sure your baking racks are set as close to the middle of the oven as possible. DO combine your flour and baking powder/soda/salt before mixing. DO let your ingredients come to room temperature before using them (not just the butter). It’s things like this that can make the difference between cupcakes that look fluffy and perfect and ones that come out half-burned or uneven and tragic. 5. Finally, if you are going to go to the effort of dirtying up your kitchen and then eating the indulgences that result from those efforts, make the best you can. Bake from scratch whenever possible. Use real ingredients. Mixes are easy, but they will never match the taste of real cake. Remind yourself and your loved ones what cake was meant to taste like. It’s my birthday this week and I’m sure there will be more cupcakes later…the only question is which kind? Catch you again soon…next time with knitting content, I promise. I am a bit iffy on Martha too…after her arrest and ankle bracelet incident…I don’t know…. thanks for this detailed review. i, too, bake for the sense of accomplishment (as well as the tasty treats). thanks also, for a more obscure bueller reference. “so choice” made my morning. Mini Raspberry cheesecakes- those must have been amazing!! I’ve been wondering about this cookbook, if it was just a collection of recipes that were on the website for free. Although sometimes it’s great to have that resource at your fingertips. Happy birthday!!! Great review! I haven’t had a good look at this one yet. Glad to know it’s worth checking out. Especially since I love to bake cake the most, whether it’s big or little. Cake is my favorite dessert! Secondly, I’m a die-hard bake from scratch kinda gal. Martha Stewart was always a little too much for me, but maybe I’ll get this book from the library and try some recipes. Thirdly, I mix everything up by hand. We don’t have space for a stand mixer and they’re so noisy. I can’t stand that! So it’s just me and a wooden spoon or a whisk most of the time, which really isn’t so bad. Birthday huh? That definitely deserves cupcakes! I’m currently on a break from wheat, trying to decide if I have an allergy to it, but I think as soon as I decide I DON’T, I’ll be in love with a book like that. All that info about cupcakes. Which I don’t think about as a fancy thing at all — more like kids’ parties, grubby hands, and happy, smiling faces. Thanks for the useful review! Great review, we have a very basic chocolate cake recipe that we make into cupcakes for the kids to take to school and kindergarten/preschool. They love to help with the measuring and the licking of the various implements. It might be interesting to get a hold of this book and see how easy it will be to translate to Australian terms/measurements/oven temps. Maybe I should just check out the webisite first, hmmmm what will we make today…thanks for the inspiration! I’d run to the kitchen immediately to bake cupcakes if my waistline could stand it! I’ve been digging into that book, too! I just backed 120 cupcakes for a friend’s wedding reception. The most popular were the Chocolate Mint and the Blondie Cupcakes. Your tips are right on! OH BOY! or rather… OH GIRL!!!! A BIRTHDAY! Reading your blog makes me happy. Plain and simple. Thanks for making me happier today (and all of those other days). Thanks so much for the review. I was looking into buying the book and wanted to check it out first. i generally shy away from baking, as it seems like so much effort. and i bear witness to the uppity-cupcake scene that is nyc…. most of them are really too dry and overpriced anyway.